I’m flying United Airlines later this month for the first time since 2004. A few days ago, United emailed me: “Don’t miss out on award miles on your trip.” The email encouraged me to sign up for MileagePlus, United’s customer loyalty program. I’m no United regular, but as I actually have three flight legs booked with them through April, I figured they had a point. But I decided to do them one better. Digging around old text files, I found my old Continental OnePass number. I pulled up my flight details and dropped in the old OnePass number. United recognized the account instantly and added it to my itinerary. Pleasantly surprised, I proceeded to log into my account, using the same number and the decade-old PIN I had on file. United.com had no trouble pulling my account together, listing my lifetime miles flown while simultaneously updating my address to the one I entered for my upcoming travel. This is what all customer loyalty programs should look like. With the right investment in database architecture, companies can have information about their customers readily available, and utilize that to surprise and delight even the most passive of patrons. Like me, the once-every-twelve-years infrequent flier, now pleasantly blogging about a company I once publicly rebuked. I recently had an unsatisfying discussion with Hyatt via Twitter where I challenged their policy of expiring accounts. Seems they are deleting my Gold Passport account next month because of lack of use—not expiring my points, but wiping out my ID entirely. Why? I asked. I got back a corporate version of ¯\_(ツ)_/¯ and a suggestion I buy some points to stay in their good graces. Compare Hyatt’s attitude with United, where any customer stickiness remains part of my lifetime value, regardless of frequency. Or AMC Theatres, where my Moviewatcher account worked for roughly 20 years, despite being forgotten for a good 15 of them between uses, when I lived out of reach of one of their locations. AMC welcomed me back with open arms (and I’m now a highly satisfied Stubs customer, too). United has now done the same, and suddenly I’m looking forward to my flight. In the wake of the Royals’ latest improbable postseason run, I’ve been thinking a lot about the recent New York Times Sunday Magazine profile of Ned Yost. In 1994, when a labor dispute truncated the baseball season, Earnhardt invited Yost to travel with him on the Nascar circuit and serve as “rehydration engineer” (in other words, water-fetcher). At one race, Earnhardt roared back from a huge deficit and nearly won. When Yost congratulated him, Earnhardt grabbed him by the shirt and pulled his friend nose to nose. ”Never, ever, let anybody who you’re around, anybody you’re associated with, allow you to settle for mediocrity,” Yost says Earnhardt told him. Never, ever, let anybody who you’re around, anybody you’re associated with, allow you to settle for mediocrity. Why are the Royals successful? Because Yost holds his players to a high standard and expects them to reach it. He doesn’t pander, second-guess or micromanage. He sets a standard and his team follows it. Ballplayers like to say they “believe in ourselves.” Royals first baseman Eric Hosmer stated as much in his post-game interview last night. That comes from the top: Yost, like his mentor Earnhardt, doesn’t let his team settle. It’s an attitude any good manager should adopt. We’ve been doing a fair amount of hiring at the office of late, and my reputation as a stickler for detail has rapidly resurfaced. Colleagues are amused at how I’ll give my head of research a hard time for interviewing a candidate with a pair of typos in his or her resume and how I’m parsing the grammar on thank-you notes. I stand by my practices, because the printed form says a lot about a person: attention to detail, communication skills, drive. The same holds true for the interviews I get to take, where I can spend more time gauging someone’s intellect, curiosity, and enthusiasm for the position (even though I think Seth Godin is onto something, and my interviews typically run 40 minutes). So I was going to do a write-up on resume and interview best practices, and then I remembered that I did this already, way back in 2000. The tips contained therein are still accurate and sound. Well, maybe not the note about avoiding italics for fax machines, but the rest of it. I’ve been following the Watch reaction since its unveiling last week, and I keep coming back to the short-sightedness of the luxury watchmakers’ reaction. But here’s the thing: anyone who buys an Apple Watch is going to stop buying other watches, regardless of price point. I keep thinking about my own use case. I’ve been a daily watch wearer since elementary school. I wear a watch with a great degree of pride, as the accessory I rely on. My watches are carefully chosen, and whether an inexpensive Swatch, an oversized Nixon or a finely crafted Breitling, they are a fixture in my life. Of course, I’m also a daily Apple user, and an early adopter of their products. I own the first-generation iPod, the first iPhone, the first iPad. I undoubtedly will buy the Watch, even though I’m not a rabid message-sender, even though I’m not a jogger, even though I’m not yet 100% certain where the new device journey will lead me. It’s a new Apple gadget and it’s a watch—I’m powerless to resist. And once I have the Watch, I’m going to wear it regularly. I will tinker with it, find its ideal use cases, answer a thousand questions about it, be proud of it as I was my other first-gen Apple products and every one of my watches. As with the iPhone, I expect it to become part of my daily routine. And once I’m doing that, well, my other watches don’t stand a chance. Because as the Watch assimilates itself to my life’s rhythms (or, perhaps, vice versa), not wearing the Apple Watch will feel like something’s missing. The vibrations and alerts and shortcuts that aren’t offered by my quartz Zodiac will be glaring omissions. Before long, I’ll be strapping on the Watch every day, just as I put my iPhone in my pocket. If the Watch works for me, my workaday watches will slowly get relegated to my nightstand drawer, and future watch purchases will shift from investing in the next object of beauty and personal expression to saving a few bucks for Watch 2. And Apple will then own a thirty-year habit of mine, just like they came to own my music and phone habits, too. Frankly, I’m not even sure I’m happy about this. But I’m going for it. I expect millions of folks like me will, too, and when they do, the disruption to the watch industry will not be pretty. Southwest Airlines has been running an ad during the NCAA basketball tournament that touts its frugal ways. The ad is transparent, honest and pragmatic. From there, the ad touts its low airfares—see? See?—as a clean extension of the value proposition behind the company. I love this commercial for its win-win approach. Southwest is calling out on national television that they’re not playing games. If you work with us, they say, it costs us less, and in turn, we’ll help you spend less, too. In today’s savvy shopping environment, it’s great to see a brand talk frankly about minding costs and passing savings onto customers. Compare this with the sign I see in the building cafeteria when I’m in my New Jersey office. It covers the front of every napkin dispenser they have. This little sign could be a win-win, like Southwest’s ad. But it’s not. It’s antagonistic. It’s a threat. There’s no mutual benefit, no collaboration, just a warning. Waste our money, and we’ll take it right out of your pocket, bucko. It helps that the cafeteria is the only place to grab lunch without a decent walk. They have a bit of a monopoly, and it shows: the food is somewhat expensive, the cooks refuse to go off-script, and certain stations randomly don’t open some days. All of which mirrors the attitude on the napkin dispensers. Don’t mess with me, eater. I’m all you’ve got. 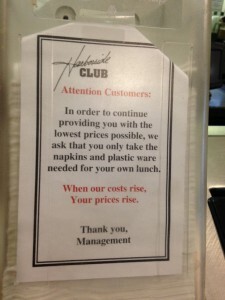 The cafeteria misses an opportunity to create customer loyalty that could have been communicated simply and effectively. 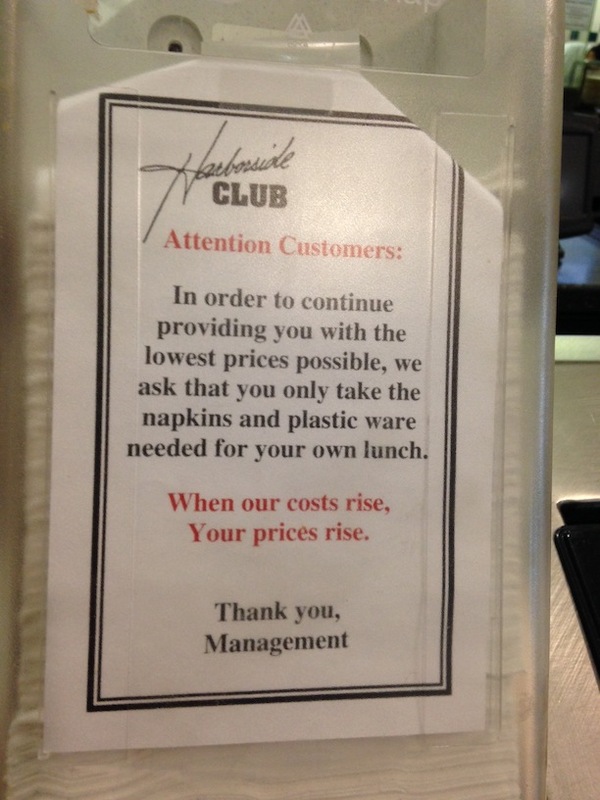 How much better would the napkin dispenser make customers feel if it said, “Keeping costs down keeps your lunch prices down,” instead of going toe-to-toe with diners? Luxottica is in the news in the digital realm right now for its forthcoming collaboration with Google on Glass-wear. Google went straight to the top on this one, as Luxottica is by far the industry leader in eyewear. The company makes eyewear under 27 different brand names, for both its own brands, such as Ray-Ban and Oakley, and a variety of high-profile licensees like Chanel and Prada. Luxottica has the market pretty well covered on the retail side, too: if you’ve ever set foot in a Lenscrafters, Pearle Vision or Sunglass Hut, you’re on their turf. The company also takes care of the eyeglasses at Sears and Target, among others. In total, Luxottica has roughly 80% of the major eyewear brands under its control. Main competitor Safilo has an impressive portfolio of licensing partners but a much smaller footprint and fewer known in-house brands. Me, I’ve been wearing American-made Bevel glasses of late, and independent ic! berlins before that. But it’s interesting to know that when I made a big switch a number of years ago from Oliver Peoples to Paul Smith, I wasn’t really changing much of anything.